I think it does need to be streamlined, but I also think it just be an awkward deck sometimes. 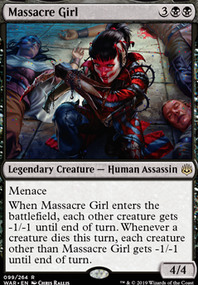 I would cut Remand for some other sort of counter magic. If it’s in the graveyard, you can just remove it instead of having them discard it again then remove it. I agree you will need boardwipes, because your deck is a lot more interactive, I’d recommend Damnation over bontu’s, plus a few copies of Fatal Push or Murderous Cut . If Wurmcoil Engine works great, but I would cut baral for another wurmcoil or gearhulk maybe. I’m not sure your budget but Liliana of the Veil is often a huge threat, as it speeds up discard and can win on its own. Collective Brutality lets you turn dead cards in hand into gas, killing things, discard, lifedrain, etc. As I’m typing I’m also thinking you want a fairly low mana curve, maybe Snapcaster Mage It’s a chump blocker and lets you get the most out of surgical/extirpate. Hope this helps, I’d save Spell Pierce for the side once you have a better feel for what you’re playing vs.
You're playing an aggressive deck so you're already in good shape to beat Tron. Early Tron can result in Wurmcoil Engine or Ugin, both of which are problematic for you. If they don't get a quick Tron they still can get to Oblivion Stone , which forces you to reset. Sorcerous Spyglass is a good option because it's good vs UW Control as well. You can name Teferi or Jace which makes it harder for them to stabilize. Then you can slow-roll your threats which makes Terminus less effective. Especially because you play some creatures with haste. To be honest I expect burn to be a harder matchup for you than Tron. I don't like that sideboard at all. Way too polarized. 3 Molten Rain and 3 Sorcerous Spyglass is more than enough Tron hate. In this meta I highly recommend graveyard hate. Rakdos Charm is graveyard and artifact hate (both very relevant). 4 Murderous Cut is way too many. If you run into Dredge you'll need more than just a Rakdos charm to win. Anger of the Gods goes a long way - much further than Blasphemous Act . Very few decks should have enough creatures to make casting Blasphemous Act easy. Although Humans and Spirits and Phoenix can outclass Anger pretty easily too. Damnation might be the move. You'll also probably run into problems with Rock decks. They have a lot of removal and card advantage. 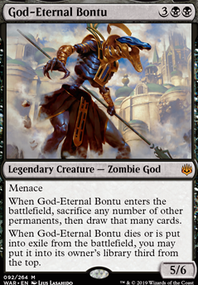 2-3 Damping Sphere - this also hates on Storm, which looks ugly for your deck. But if you're worried about taxing yourself then play Molten Rain or Fulminator Mage . Molten Rain and Fulminator are also really really good vs Control. 2 Collective Brutality - Awesome against Burn and control and combo decks and synergizes with your madness. If your burn matchup is good then don't bother with this. 0-3 Fatal Push or Dreadbore or Murderous Cut . I wouldn't play more than 1 Murderous Cut . 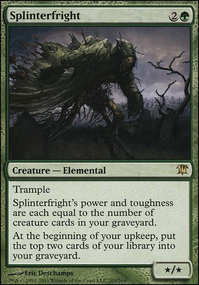 But having spot removal for Thing in the Ice Flip, Crackling Drake , Tarmogoyf , Scavenging Ooze , etc. is a good idea. Thank you for those suggestions, sylvannos! Taking them into consideration, what about the following list? My local meta is heavy on burn and Tron so I've included mostly anti-tron cards. Thanks wallisface. Maybe that's part of why I don't use the card. To the OP: Mission Brief Trap, I only use Hedrons as creatures and only 3 other playsets of mill, the rest of my deck is all card draw, life gain, creature removal, discard and any interaction I can think of. My deck isn't casual or budget and I still use Murderous Cut . 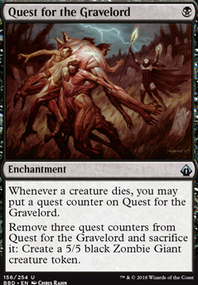 Night of Souls' Betrayal , Crypt Incursion and even Opt . They (and Duress / Divest ,) are all good things and you are likely to find one or more fit your idea of fun. The best budget mill cards are: Hedron Crab (add some Evolving Wilds for more triggers), Fraying Sanity , Breaking , Manic Scribe and Mind Funeral . I'd try to build those playsets. Your current creatures/artifacts look more like they are there to keep you alive, that actually help you win. One option would be to build your mill with the budget millcards above and find other ways to keep yourself alive (if that could fit inside your idea of fun): Divest pre-creature removal, Murderous Cut , Mission Briefing could also help you repeat any of your mill spells and Fountain of Renewal could help with lifegain and card draw..